The mid Norfolk civil parish of Sparham is situated south of Reepham and west of Great Witchingham. Its name comes from the Old English for ‘homestead or meadow with an enclosure’. The parish has a long history, and was certainly well established by the time of the Norman Conquest, its population, land ownership and productive resources being detailed in the Domesday Book of 1086. The earliest evidence of human activity comes in the form of Palaeolithic flint tools, such as a handaxe (NHER 3017) found in 1958. Palaeolithic, Mesolithic, Neolithic and Bronze Age flint tools (NHER 3018) were found in Leech Pit Wood in the early 20th century. A Mesolithic flint microlith (NHER 15733) has also been recovered. Neolithic flint finds from elsewhere in the parish include pottery fragments (NHER 3023), polished axeheads (NHER 14885 and 15597), a laurel leaf blade (NHER 14885), a flake (NHER 39934) and a stone polisher (NHER 3019). Excavation of hearths in a gravel hollow in 1959 recovered Neolithic pottery fragments, flint flakes and charcoal. The site has since been destroyed by quarrying and is now covered by Sparham Pools. Two Bronze Age barrows (NHER 3021 and 3022) were recorded in the same area, but had been quarried out by 1976. Bronze Age finds are a stone battleaxe (NHER 3020), copper alloy axeheads (NHER 31774 and 31813) and a Late Bronze Age hoard of copper alloy objects (NHER 34690), including fragments of sword blades, spearheads, axeheads, knives and bracelets. Iron Age finds are currently limited to a piece of pottery (NHER 29487), a brooch (NHER 31813) and a toggle (NHER 31774). Roman objects recovered to date include coins (NHER 31813, 35297 and 35809), pottery fragments (NHER 35809), a vessel handle and brooches (NHER 31733 and 31813), a key (NHER 31813) and a stud (NHER 32351). The cropmark of an old road (NHER 14228), visible on aerial photographs has been suggested as Roman in date, but this is thought to be unlikely. Saxon finds include a large piece of a Middle Saxon pottery pitcher and other pottery fragments (NHER 29487), a mount (NHER 32322) and a hooked tag (NHER 36229). The medieval period has left the parish with its earliest surviving building, St Mary’s Church (NHER 3059) on Well Lane. This is a large church consisting of an imposing west tower, tall aisled nave, south porch and chancel. Much of the building is early 14th century, the nave at that time having a lower roof and a clerestorey with small quatrefoil windows, two of which can be seen, blocked in, above the arches at the east end. The nave was remodelled and extended west in the 15th century, when the current tower was built. The south porch was also added at this time. There appears to have been some confusion about where the tower and nave would meet, as the two western arcade arches are wider than the others, seemingly stretching to reach the tower. Above the west door is a niche with a vault, presumably for a figure of St Mary, flanked by a pair of tiny shafts capped with carved beasts. Inside is the great treasure of the church, the surviving two sections of the dado to the rood screen, dating to about 1480 and now against the north aisle wall. One section has two empty panels and two panels depicting St Thomas of Canterbury and St Walstan. The other section has two Dance of Death panels of exceptional rarity and interest. One shows a skeleton in a shroud pointing to a font. On the adjoining space are two grinning cadavers in fashionable costume, the woman offering a flower to the man. Both scenes are accompanied by doom-laden Latin biblical inscriptions. Also to be seen inside is a much restored 15th century pulpit, a brass of about 1490 to William Mustarder, a rector, and a Gothick organ case of about 1800. The east window dates to 1948. Other medieval buildings have not survived, but have left traces of their prior existence. Northwest of the church, a spread of flint, brick, pantiles and medieval pottery fragments (NHER 12897) noted in 1977 is probably the site of a house. In the north of the parish is the probable site of medieval Stewkey Hall moated manor (NHER 17116). Parts of the surrounding moat survive, with an entrance causeway to the central island on the east. Quite a number of medieval objects have been recovered, including coins (NHER 31765, 31813 and 32351), pottery fragments (NHER 29487 and 32597), horse harness pendants (NHER 30450 and 31774), seal matrices (NHER 30581, 31774 and 32351), buckles (NHER 31765, 32351 and 35809) and a lead pilgrim bottle (NHER 32351). Of the post medieval buildings to survive, probably the oldest is Church Farm Barn (NHER 46543) on Well Lane, a 17th and 18th century brick barn with a tiled roof and later alterations. Sparham House (NHER 46266) on Stewks Hall Drift is a two storey brick house of 1820 with embellishments of about 1840 and later additions, built for Reverend James Stoughton. The east façade has three window bays and a central front doorway with a replica stone pediment on consoles. To the south is Sparham Limekiln (NHER 7361), a post medieval limekiln that ceased to function in the 19th century and was then converted into two cottages, one above the other. After an unsuccessful attempt at restoration in the 20th century the upper cottage was demolished. 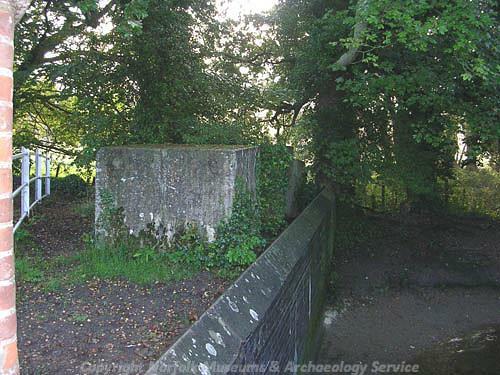 The most historically recent entry on the record is a group of several World War Two concrete anti-tank blocks (NHER 30945) of about 1940, situated at the north end of Lyng Bridge over the River Wensum to the east of the road. P. Aldridge (NLA), 26 July 2007.
http://www.norfolkchurches.co.uk/sparham/sparham.htm Accessed 25 July 2007.